I wish I could remember how old M was when she did this project… probably around three years old given the style of the person she painted. 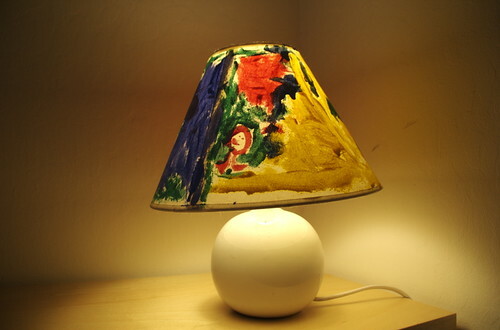 I have a bunch of IKEA table lamps scattered around the house. Somehow, I ended up with an extra lamp-shade. On a rainy weekend afternoon I set M up with the tempera paints and some brushes & let her do her thing. I liked the result so much I put this one in my bedroom so I could see it every evening. It casts a lovely glow in the room. I love the idea of quite craft time but I cringe when I think of letting my kids paint unsupervised. How do you control for the inevitable mess? And no matter how they promise to clean up, it’s always me scraping paint splatters off various surfaces…Ideas? This one was not un-supervised since she was quite small at the time. I cover the table with newspaper, and the kids either paint shirtless or in something we don’t care too much about. It’s also a good way to get the kids into the bathtub to see what color they make in the water! Tempera paints are washable, so they don’t worry me too much. You can also use an old button down shirt, worn backwards as a smock.